An update is coming to Arena of Valor. 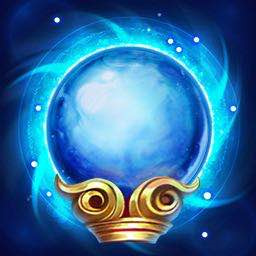 Included in this update will be balance improvements for heroes, as well as adjustments to the user interface, arena mechanics, in-game equipment, and more. We hope this update causes matches to feel more fair and exciting, providing all players with an overall better experience. Death Match is a new game mode where five elemental factions, each consisting of two players, battle it out against one another simultaneously. Each elemental faction has its own spawn point on the map. When you kill an enemy, you obtain the points above that enemy's head. A match lasts 8 minutes, and ranks are calculated according to each team's score at the end of the match. Consider killing enemies with higher points to earn more points for your faction. If your faction is behind, pay attention to positioning and strategize how best to make a comeback. Forming temporary alliances with other factions and attacking the team with the highest score can turn any match around in an instant. We've overhauled the lobby UI in the latest version to make it more convenient and attractive. 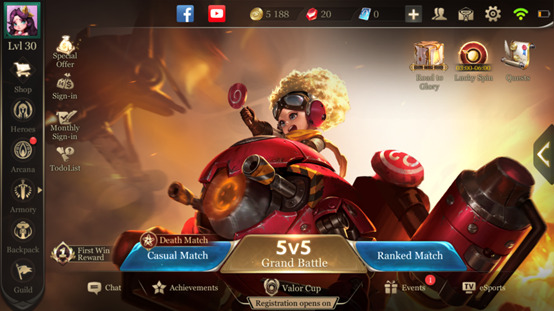 For example, we've moved the Casual Match and Ranked Match buttons to the bottom and added quick access to 5v5 Grand Battle so that players can get into a game faster. We have also added places to claim rewards at the left and top right of the lobby. All reward events will be consolidated here, making it quicker and easier to take part in events and claim rewards. This means there's no need to worry about missing reward events anymore! In addition, you'll also be able to follow the official Facebook page and YouTube channel from the lobby UI for the latest official news, to watch interesting videos, and to meet friends with the same interests. This visual overhaul also provides a bigger display space for heroes and skins. We think you'll agree that the lobby interface looks better than ever! 1. Exclusive Hero and Skin Tokens. These all-new tokens will allow you to collect even more heroes and skins. 2. A Valor TV feature has been added which lets you watch live matches, check match schedules, and watch match recordings of particular events. 3. A new monthly sign-in feature has been added. Now players can receive rewards from daily sign-ins and by accumulating sign-ins. 4. A new quest system has been put it place to help beginners progress faster. These "beginner quests" can be completed to receive rewards. 1. Optimized the display interface of the 14-day sign-in for beginners. This display will now pop up directly in the game, making it more convenient for new players to sign in and claim rewards. 2. Optimized prompts regarding hero and skin rewards in the event interface. The event rewards will now show if you already own a hero or skin. 1. You can now mute the microphone when recording video from the Highlight Reel so that only in-game audio is recorded. To ensure balance between red and blue minion waves, we've optimized the model size of the minions, the routes they travel, and their performance in battle. Optimized the attack priority of normal monsters. When monsters were attacked and entered battle, they used to prioritize attacking the unit that damaged them. 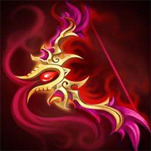 This gave long-range heroes the ability to lead monsters far away. This has been changed so that monsters will prioritize attacking the enemy unit nearest to them, which is a more reasonable behavior. Optimized the sound effects and visual effects for last hits. Added three new pieces of equipment: Anabolic Rage Bow, Rock Shield, and Arctic Orb. Unique Active - Coagulate: Immune to all effects for 1.5 seconds. Unable to move, attack, or use abilities. 1.Improved the running animations for a large number of heroes so that their running actions match up with their Movement Speeds. 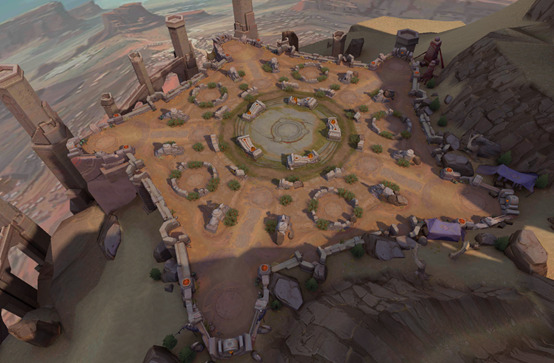 2.Since it's possible for Max to fly off the map in some locations, we've banned the use of Max in both 3v3 and Death Match modes.